WASHINGTON (AP) — America and the world can “sleep well tonight,” President Donald Trump declared on Wednesday, boasting that his summit with Kim Jong Un had ended any nuclear threat from North Korea though the meeting produced no details on how or when weapons might be eliminated or even reduced. While Trump claimed a historic breakthrough at the most significant diplomatic event of his presidency, Secretary of State Mike Pompeo, was more measured. He said that Trump’s tweet was made “with eyes wide open” to the possibility diplomacy could falter, and that the U.S. wants North Korea to take “major” nuclear disarmament steps within the next two years — before the end of Trump’s first term in 2021. And while North Korean state media had claimed that Trump and Kim agreed to “step-by-step” actions — an apparent euphemism for phased sanctions relief in exchange for phased denuclearization — Pompeo ruled that out. He insisted that Trump had been explicit about the sequencing from the start. 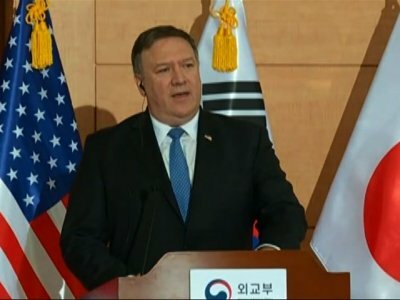 He bristled at questions from reporters about the vague wording of the statement where North Korea “commits to work toward complete denuclearization of the Korean Peninsula” — a promise it has made several times before in the past 25 years and reneged on. Although Trump before the summit had insisted on “complete, verifiable and irreversible” denuclearization, the deal he signed with Kim made no mention of those last two conditions.